Outside of the GTA series, the last time I got excited for riding virtual motorbikes was when, well, ExciteBike was around, back in the 8-bit era. Who knew it would take a couple decades and a little Xbox Live Arcade gem called Trials HD to make me fall in love with simplistic two-wheeled joy riding again? Pure in design and flawless in execution, Trials HD pulls off the rare feat achieved by only the upper echelon of arcade titles like Geometry Wars or Lumines Live. That is, the game is easy to learn, hard as nails to master and compulsively addictive in its simplicity. Hold on to your hats: Trials HD is an arcade game about -- wait for it -- time trials, performed whilst riding a dirt bike at high speeds. 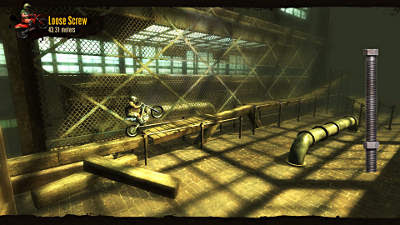 Developer Redlynx, gave birth to the Trials sensation first as Flash web games. Now the same physics-based motorbike stunt racing has graduated to the Xbox 360 in full HD, complete with a new graphics engine, leaderboard support, 50 tracks spread across 5 difficulty levels and a track creation & sharing tool. To call Trials HD a simplistic experience undercuts a very sophisticated physics system that must be mastered if you want to post a top time or, in the case of the higher difficulties, make it to the finish line without suffering dozens of restarts. The basics are laid out from the outset: right trigger controls the gas, left trigger the brakes. Your center of gravity or lean, is governed by the left thumb stick and the importance of this control can`t be overstated. A soft touch on the left stick will often prove the difference between a soaring jump off a death-defying ramp and a crash landing that rag dolls your virtual biker face-first into the asphalt. Circuits are unlocked as you complete tracks and they escalate in difficulty very quickly. Things go from "hmm, not as easy as it looks" to "oh dear these level designers are downright sadistic" in the blink of an eye. Thankfully, the hair-pulling frustration is mitigated by a restart system that should be studied and duplicated throughout gamedom. Similar to other score attack classics like Geometry Wars, Trials HD understands that you will be replaying the same track countless times and so it allows you the option of either pressing the "back" button to restart from the starting line instantly or pressing "A" to restart at the last checkpoint. No loading times, no pointless transition screens, no waiting. RedLynx: thank you, thank you, thank you. Leaderboard tracking is also brilliantly realized and engineered to get your competitive juices flowing. As you race, a progress meter at the top the screen will show real-time "ghost markers" that represent your friends and how they performed on the same track. At the conclusion of each level, you're taken directly to the leadboard rankings for that track with the usual options to replay the track or move on to the next one on the list. Simple, elegant and smart design triumphs again. At the time of this writing, I haven't had any chance to delve into the track editor although I understand it is the exact same tool the developers used to design all the core tracks. The sharing of your creations is slightly restricted as it isn't openly available to anyone who owns a copy of the game. Custom tracks need to be shared out and are only available to players on your Xbox Live friends list. I've played some home brew tracks already and from my brief exposure it's pretty clear the influence of those devilish RedLynx designers is rubbing off on their fans. People are building some ridiculously challenging tracks! Trials HD is an exceptional Xbox Live Arcade gem that deserves its elite billing during the recent Summer of Arcade promotion. The transition to the console space has done wonders to the production values: the 3D graphics (played on a 2D plane) are gorgeous, if a bit bizarre and even the relentless drum n'bass soundtrack contributes to that compulsive "one more try" quality that only the best arcade games can hold claim over. For 1600 Microsoft points, it's still packed with content and decent value for the money (I haven't even talked about the Skill Games section). Some criticisms can be leveled at Trials for its unforgiving difficulty or lack of co-op and hot seat play, but they're minor gripes weighed against such an outstanding overall production. - Quick restarts at any time with no load times: DEVELOPERS TAKE NOTE!